The soybean industry is beginning to place itself as one of the leading crops in the grain and oilseed industry. Soybean production is rising annually, matched with a rise in global demand. The latest estimates by the USDA, indicate that world soybean production is likely to increase to 345 million tons in 2017/2018 season, which is a 10,1% increase in two years. In the World Agricultural Supply and Demand Estimates report (WASDE), the USDA indicate that the 2016/2017 soybean production is likely to have been the largest crop in a decade, currently sitting at an estimated 348 million tons. The key drivers in the increasing soybean production are the United States of America (USA), Brazil and Argentina, who collectively contribute 81% to the global soybean production. USA alone is set to produce 45% share of the global production, meanwhile Brazil and Argentina account 31% and 17%, respectively. China, who is also among one of the largest soybean producers, has gained the status of the leading importer of soybeans. Soybean imports to China have shown an increasing trend over the years, and are expected to increase to 93 million tons in 2017/2018, compared to 82 million tons in 2015/2016 season. Locally, soybean production is also on the rise. South Africa which is Africa’s leading soybean producer managed to harvest 1,06 million tons of soybeans in the 2015/2016 season, which was considered a record crop. 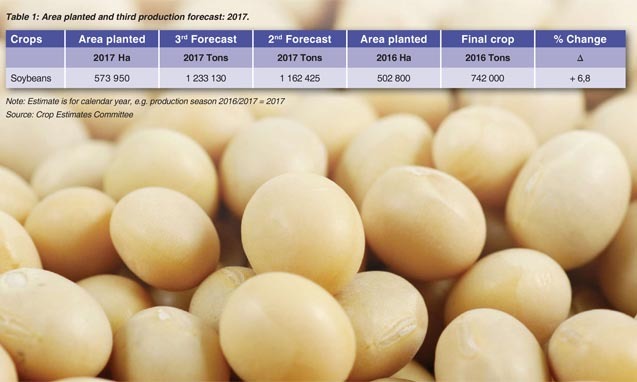 However, in the latest crop estimates reported by the Crop Estimate Committee (see Table 1), soybean production for the 2017/2018 season is estimated to reach 1,2 million tons, an increase of 66% from the 2016/2017 season. It is worth noting that based on the estimated 2017/2018 record production of 1,2 million tons; South Africa would not require any imports, meanwhile, exports could increase by a marginal 4,5%. In this case, it is clear that South Africa is likely to move away from the status of a net importer of soybeans, given the emerging production trend. Based on the rising trend of soybean production, it is evident that global soybean supplies have expanded strongly in recent years and plantings are likely to trend up to new highs in years to come. World production is also expected to increase, underpinned by rising demand for high-protein meals.